Through the training modules for flame generators, the trainee practice to distinguish the types of fire he/she is facing: Class A, B, C, D or F fires. Waste bin module attaches to Flat computer screen module for high modularity. The training modules for fire trainer teach how to select the correct fire extinguisher for each type of fire: water spray extinguisher, water + additive extinguisher, powder extinguisher, CO2 extinguisher or foam extinguisher. For a waste bin fire, the most suitable fire extinguishers are the water spray extinguisher, water + additive extinguisher or foam extinguisher. The training modules for flame generator are perfect for learning how to apply the right technique to extinguish a fire: spraying the extinguishing agent onto the fire, covering the fire with a wet cloth, oxygen suppression, etc. The training modules for fire trainer are perfect to familiarise trainees with all fire extinguishing situations such as waste bin fire, deep fryer fire, electric motor fire and oil explosion. To operate, this module is attached to the "Flat computer screen" module. The flat computer screen, then equipped with this element, turns into a waste bin. This module simulates a waste bin fire and allows trainees to practice how to extinguish this type of fire with the help of a training fire extinguisher. 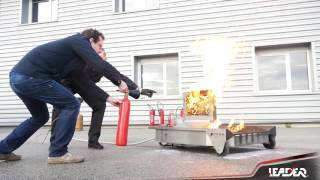 This LEADER fire trainer / flame generator module simulates a waste bin fire! Mounting same as Flat computer screen module.